Superb performance by #PeshawarZalmi against #Gladiators ! 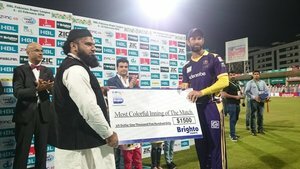 A big match swept away by #zalmis in style! 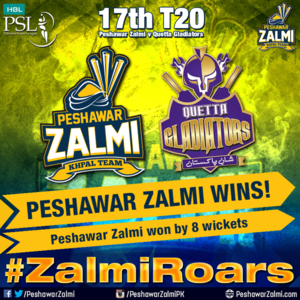 Keep roaring #Zalmis ! #PeshawarZalmi beats @TeamQuetta in a dominating style! The Skipper gives a performance of a lifetime! Career best by the one & only #BoomBoom @SAfridiOfficial ! Mubroook @PeshawarZalmi we won again ???????????????????????????? Congratulation @PeshawarZalmi 5/7, The Revenge.. Better luck next time Gladiators! !